Magnet Mouse - Why Am I Me? 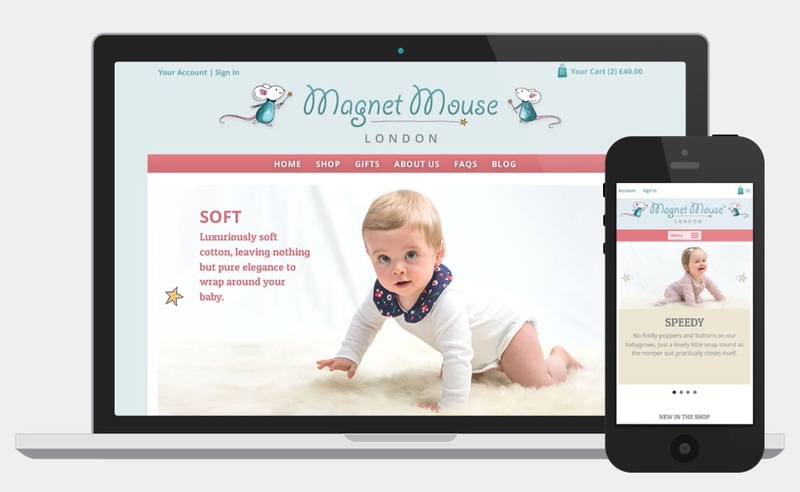 Responsive e-commerce web design and branding for Magnet Mouse, manufacturer of innovative and luxurious baby clothes. Magnet Mouse create baby clothes with a difference and the clue is in the name. Instead of using fiddly poppers or buttons to secure their baby clothing Magnet Mouse use magnets. Mouse, who owns and runs Magnet Mouse, needed an e-commerce site to sell her wares to the world. Initially the online shop would contain a small number of items but the design needed to accomodate a growing range of products as the business expands, the product database would also need to be edited in a Content Management System and items would also need to be displayed and filteres by colour and age range. The process began with some branding. Mouse had drawn some mouse characters to go on the labels of the clothes so I integrated one of the characters into a design for the logo and used that as the basis for a colour palette. We then looked at competitor sites as well as other clothing sites and discussed what would work for Mouse. As the product database was going to be small, we decided not to have a search facility but to display all the products in the shop with search filters to match certain criteria like colour and size. I then mocked up some designs in Adobe Fireworks for Mouse to view, the results were pretty close to the final design after a few tweaks.